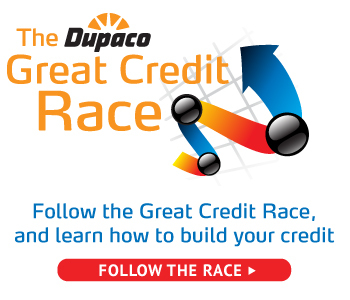 Dupaco’s Great Credit Race is heating up, with three racers now tied for the lead. Dupaco members Anna O., Kiernan S. and Brett B. continue moving their credit scores in the right direction—all reporting scores of 703 this month. “I’m hoping I’m going to win, but I really wasn’t looking forward to tying with two other people,” says Kiernan, of Dubuque, who was previously tied for first place with only Anna, of Dyersville. Beginning May 1, participants began racing to build their credit scores from 0 to as high as possible in six months. The participant with the highest score at the finish line wins $1,000. The newest front-runner, Brett, of Hiawatha, saw his credit score jump three points since last month. He’s taken a slightly different approach with his Dupaco Visa credit card, which was issued to each racer. “I’m sticking to the plan and making one small purchase a month and paying off the balance when I get my bill,” he says. The other race leaders also use their cards for occasional, small purchases, but they pay off their balances immediately. While the competition to great credit remains friendly, there’s no doubt the race leaders have their eyes on the prize. Two of them offered some (mostly) positive encouragement to one another.